Not everyone has the good fortune of aging gracefully. The dream, for most, is to live out the "golden years" with a healthy mind and body — surrounded by friends and family — along with the promise of new adventures. And while a lucky few are able to live out that fantasy, the truth is that most seniors experience life as a series of peaks and valleys. 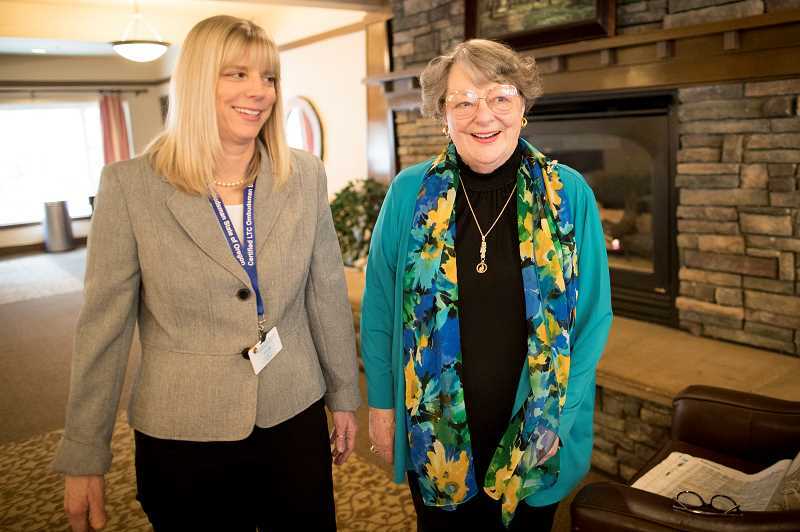 Luckily, Oregon's Long-Term Care Ombudsman program has volunteers like Kim Arabia who work tirelessly to look out for all residents who live at nursing or assisted living facilities, as well as residential care facilities, adult foster homes and endorsed memory care. The program is described on its website as "an independent state agency that serves long-term care facility residents through complaint investigation, resolution and advocacy for improvement in resident care." Arabia has been an ombudsman in Wilsonville for three years, and she's responsible for covering two facilities: The Springs at Wilsonville and Marquis Wilsonville. "You basically visit your facilities on a regular basis, which is typically once a week," Arabia says. "And then you handle any cases that are submitted through the Salem office. Basically, someone calls the 800 number and says, 'I have a situation' — it's either the resident or a family member — and then I go out and investigate." If Arabia can solve a problem herself — be it related to food, laundry, hygiene or behavior — she will. "On other cases, I call my deputy who works out of Salem," Arabia says. "She's a paid employee, and I'm a volunteer. ... Sometimes we have to pull in Adult Protective Services depending on the severity of the situation." Often, though, it's something relatively minor that Arabia can address. "We get a lot of complaints about food, about care of residents, if the family members think they need more baths or more hygiene or laundry isn't being laundered correctly," she says. "Sometimes you get more severe cases but a lot of it is kind of basic stuff." And she'll never turn someone away. "(I investigate) anything they come to us with, no matter how small," she says. "If they say, 'I don't like the frosting on the cake,' I have to investigate it. Nothing is too small." On a typical visit to one of her facilities, Arabia walks around and talks to residents while also checking every room to "make sure nothing is awry" and that there aren't any hazards that might endanger people. She also observes staff to make sure residents are being cared for in a timely and considerate manner. "If I see something bothersome, I'll go to the administrator or bring it up with a caretaker," Arabia says. Arabia has volunteered throughout her life, beginning when she was a teenager. She was inspired to join the ombudsman program three years ago in part due to a prior personal experience. "I was looking for opportunities and this came up," she says. "It caught my eye. I had a grandma in her late 80s who was in a bad situation and really needed an ombudsman, and the program kind of resonated with me. I found it on my own, signed up and have loved it ever since." Training includes five sessions that each run from 10 a.m. to 3 p.m. The next training program begins April 17 in Tigard. What's most rewarding for Arabia is seeing how small gestures can make a profound impact on residents' lives. "I would get them something as simple as a microwave, and you would have thought I got them a million dollars," Arabia says. "It's little moments like that. They are so thankful. ... To me it's the best feeling." And, according to Arabia, it's not difficult to get involved. Volunteers should have a flexible schedule and at least four hours a week to devote to the program. They must be at least 21 years of age, have a way to get around and be able to pass a criminal background check. Additional resources can't come soon enough in Wilsonville, according to Arabia. "There's a lot of facilities that don't have (an) ombudsman, and the best scenario would be that every facility has an ombudsman," Arabia says. "We definitely need more volunteers." Arabia has done a few cases in Charbonneau, but the program currently does not have a volunteer dedicated to the community. "I want to say there used to be a couple more volunteers," Arabia says. "Maybe someday I could add Charbonneau." She wouldn't have to, of course, if more volunteers step up. "The elderly are kind of a generation that's put on the back burner," Arabia says. "I don't want to say 'forgotten' but they don't always have a lot of people there for them. "Knowing you're there for residents and you're advocating for them, helping (get) a resource for them, is very rewarding."